On 30th June 1908, at about 07.30 in the morning, people at Venevara in the middle of Siberia, were shaken by the sight of and sound of a huge fireball heading for earth. It exploded some 40 miles away in the taiga forest. The blast knocked people over, and smashed windows. Venevara was accessible only by way of the Podkammenaya (stoney) Tunguska river and then only in summer. The nearest city of any size was Krasnoyarsk - on the trans-Siberian railway. (And which was forbidden as was Yakutsk to foreigners under the USSR until 1991). Irkustsk, 550 miles away picked up the seismic shockwaves which travelled twice around the Earth. Dust from the impact filled the atmosphere, reflecting light and making the midsummer night sky even lighter than usual, so you could read a newspaper at midnight in London. It was 29 years later before the first scientific expedition, led by Leonid Kulik, arrived to investigate the event. Helped by the local Evenks, it still took the scientists a month to reach the place of impact along the rivers. Here they found that trees had flattened in a great butterfly shape, but the trees near the centre were still standing - although totally stripped of branches so they looked like telegraph poles. Here is one of the photos they took in 1927. For Kulik the investigation was to be his life's work. He was sure that the remains of the meteorite must be hidden in the swampy ground, but nothing was ever found. This created a mystery and all sorts of explanations, some of which make the shaman's story (quoted further on) seem reasonable. They include an early British atom bomb test and an alien spaceship landing. Later scientific investigations have confirmed that the impact was caused by a stony meteorite from the Β-Taurid meteor stream of debris off Comet Enke, which entered the Earth's atmoshere at a speed of about 25 kilometres a second, at an angle of 30 degrees to the ground, thus causing the butterfly effect of the blast. Interestingly plants in the area have abnormal chromosomes, more like you would expect around Chernobyl. Genetic abnormalities - birth defects etc. were first noticed in 1910. Also there are rare metal concentrates in the 1908 layer of peaty soil. And magnetic disturbances were recorded at Irkutsk at the time of the blast - and these are similar to those found following a British nuclear test blast at an altitude of 10 to 12 kilometres. In the centre of the blast zone there is a change in the magnetic orientation of soil particles. The meteorite had exploded with the energy of 15 megatonnes - that is equivalent to 15 times the A-bomb which destroyed Hiroshima in 1945. If the meterorite had impacted a few hours earlier, it might have destroyed St. Petersburg, or Berlin, or London, and changed the course of world history. Instead it impacted in a sparcely inhabited region where Tungus (Evenk) let their herds of reindeer graze. A herd of reindeer four miles from the impact was wiped out. The owners of the herd lost everything. People were knocked down by the blast and their tents blown to bits. Two people died - several were injured. They received no official help at all. But their fate was not ignored by everyone. 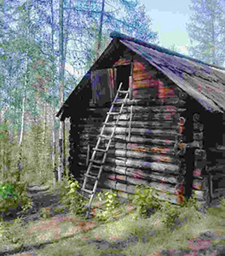 Before Kulik's expedition arrived on the scene, an ethnographer, Innokenty Suslov (1893-1972) set out to try to find out what had happened from the Evenk people who lived here. In the political atmosphere of the time, Suslov's work could only be published if used as part of the government campaign against the shamans and their influence. So it was published in 1931, as "The Struggle against Shamanism" and in 1932 as "Shamanism as a hindrance to social construction". In 1983 it was translated into German by Karl Menges and was quoted by Joachim Otto Habeck in an paper for the Scott Polar Research Institue. 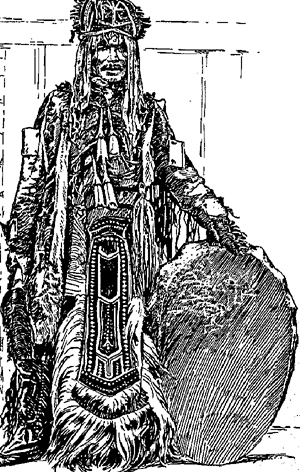 The illustration of a shaman from the Tunguska region is from The Times, Russian Supplement, 1915. The genuine ethnography buried in these tracts had the effect of preserving the traditional rituals and customs to be used as guidence when they were revived after the end of the Soviet Union. Suslov discovered that the local Evenk people attributed the blast to a great shaman called Magankan. He would get people to fire a rifle at him - he could catch the bullet when it came out of his body and show it to everyone there. He would stab a knife into his chest and no wound could be seen. For a long time there had been war and feuds between the Evenk clans living along the tributaries of the Lower Tunguska. This led to the rival shamans sending their evil spirits against each other causing diseases and other troubles. Then Magankan called on the Agdy. The Agdy is the God of Thunder (who looks like an old man) but also the Agdy birds - the Thunderbirds - big, black and made of iron, with fiery eyes. The beating of their wings causes thunder and lightning flashes from their eyes. Ancestors of the Agdy live in Khergu - the underworld as do the souls of shamans, so many of them were friends with shamans and this relationship had been passed on to their descendants. An evil shaman can call on the Agdy to do harm to anyone he bears a grudge against. This happened in the early morning of 30th June 1908. A flock of Agdy were called by the shaman Magankan. The Agdy came down on the territory of the Shanyagir clan. Tents were blown into the air. People were hurt. 250 reindeer from the herd of Andrei Onkoul disappeared without trace - and other reindeer and also dogs were killed. The wooden storage houses on platforms, where they kept all their food, clothes and equipment were totaly destroyed in just a few seconds. The taiga forest was flattened for about 10,000 square kilometres in the areas of the rivers Chambe, Zhilushmo, and Kushmo. There was a great noise like thunder and great cracks appeared in the earth. People fled leaving all their possessions. Two people died in the blast. Although the local people had lost everything they needed for survival - no investigation or aid was ever received from either local or national adminstrative and government bodies. 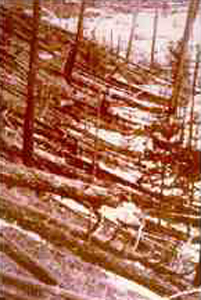 The Tunguska Event was investigated by the physics department, University of Bologna.